NEWARK, DE – FEBRUARY 7, 2019 – Integrity Staffing Solutions, one of the leading staffing and recruitment agencies in the United States announced today that they have won ClearlyRated's Best of Staffing® Client Award for providing superior and outstanding customer service to their clients. 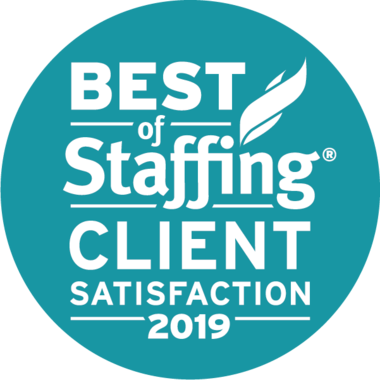 Presented in partnership with CareerBuilder, ClearlyRated Best of Staffing Client winners have proven to be industry leaders in service quality based entirely on ratings provided by their clients. On average, clients of winning agencies are 2.2 times more likely to be completely satisfied with the services provided compared to those working with non-winning agencies. Focused on helping its clients find the right associates for their job openings, Integrity Staffing Solutions received an average Net Promoter Score (NPS) of 67% which is well over the staffing industry average of 9%. Any staffing agency earning over a 50% NPS in the staffing industry is considered ‘world class’. In fact, less than 2% of all staffing agencies in the U.S. and Canada have earned the Best of Staffing Award for service excellence. As an industry leader specializing in high volume, clerical and light industrial staffing solutions, Integrity Staffing specializes in creating innovative employment solutions for both its clients and associates. Since its launch in 1997, Integrity Staffing Solutions has been committed to generating opportunities for its associates to exceed their own expectations by supplying the skills that advance future fulfillment. The company specializes in temporary and direct-hire employment and customized staffing models that facilitate the growth of careers, communities, and companies. A true engine of opportunity, Integrity is based on the philosophy that its clients succeed only when its associates succeed. For additional information about Integrity Staffing, please visit: IntegrityStaffing.com or follow us on Facebook, Twitter and LinkedIn.